The National Oceanic and Atmospheric Administration’s (NOAA) latest geostationary weather satellite GOES-17 has completed its calibration phase and is now operating in the GOES West position, helping National Weather Service (NWS) forecasters to predict storm systems, fog clouds and wildfires. “GOES-17 is the latest in a series of the most advanced weather satellites which have ever been launched into orbit,” said the US secretary of commerce, Wilbur Ross. Launched on March 1, 2018, GOES-17 joins GOES-16, also known as GOES East, to deliver lightning observations and high-resolution visible and infrared imagery covering more than half the globe. 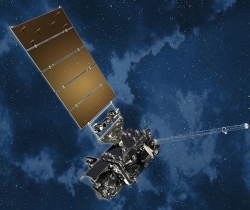 NOAA also announced that NOAA-20, the first spacecraft in the Joint Polar Satellite System, will operate as NOAA’s primary afternoon polar satellite. It features the most advanced technology NOAA has ever flown in a polar orbit. GOES-17 is providing both increased and improved data over the Pacific Ocean, where observations were previously limited, and where many weather systems that affect the continental US originate. GOES-17 also allows forecasters to predict, with greater accuracy than before, the timing of fog and cloud formation and when it will clear, helping to mitigate ground delays. Among the benefits of the satellite’s high-resolution and rapid-scan capabilities is a significant improvement in detecting and analyzing wildfires and the extent of smoke coverage. With its new spectral bands providing high-definition images as often as every minute, GOES-17 is helping forecasters locate hot spots, detect changes in a fire’s behavior, and predict a fire’s motion better than before. This information helps firefighters on the ground combat fires more effectively and emergency managers plan life-saving evacuations sooner.